For most people, the mere thought of a root canal conjures up feelings of discomfort. These feelings, however, pale in comparison to the pain caused when a tooth’s root is infected or succumbing to the effects of severe decay. Then, root canal therapy, or endodontic treatment, can be a tremendous relief. At Mod Squad Dental in San Diego, CA, our dentists can perform a painless root canal to save your tooth and leave you pain-free. If any of these symptoms are present, then decay or infection inside the root of a tooth may be indicated. 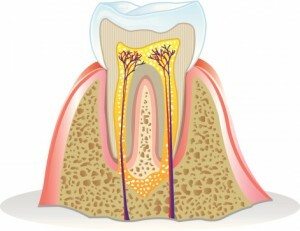 A root canal is the procedure whereby this decay and infection are eliminated. Your dentist at Mod Squad Dental will remove the soft pulp inside your tooth that contains nerve, blood and soft tissue. Once removed, the inside of the root is thoroughly cleaned and sealed from further decay and infection. Usually, the tooth will then need a dental crown for protection. If you are experiencing any of the symptoms mentioned above, then a root canal may be the solution. Call the office of Mod Squad Dental in San Diego, CA, today. Our dentists and staff are ready to help you with a painless root canal, so you can go about your day pain-free. We conveniently serve patients in Rancho Pensaquitas, Poway, Scripps Ranch and the surrounding areas, too.